Of course, it's Figaro who upstages Almaviva in the opening scene, and Hyung Yun registers a resounding triumph with the most familiar patter song in all opera, the "Largo al factotum." Yun was not only up to the increasing speed of the aria, he refused to hide behind the language barrier, sounding like he was saying something rather than zipping through an advertising jingle. Sher's impulse to turn the title character into an action hero was understandable given the tendency for him to devolve into a lovable clown, but Yun's Figaro remains a clever and resourceful rogue. No, Figaro doesn't have to beg like a silly slave when Almaviva and Rosina delay their escape from Bartolo's home late in Act 2, nor does he need to counsel haste and quiet to the lovers like a sensible big brother. Yun takes a neat middle way, preserving the comedy that Gilbert and Sullivan must have cherished (see the denouement in The Pirates of Penzance). I also appreciated how Yun held up his end of the "Fortunati affeti mei" duet with Rosina in Act 1, Scene 2, earnestly expressing his admiration for women's aptitude for deceit without becoming - as we usually hear - a mere background drone. 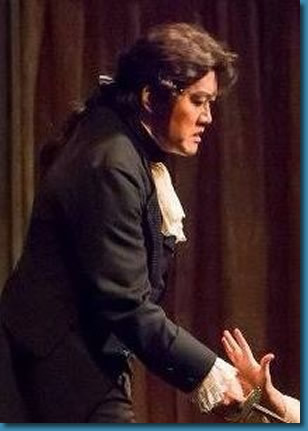 Baritone Hyung Yun was a committed performer who milked lines with passionate sincerity. "Yun's powerful, dark-hued baritone sets a bellicose mood early on. Later, as his machinations play out tragically, he warms his singing to reveal remorse. "